Dressing For Your Body Shape means finding the best clothing, hairstyles and accessories that show off the best aspects of your figure is likewise going to be a unique process. The idea behind selecting clothing for different body shapes is teaching people how to look at themselves and their prospective wardrobes in a new way - with a fresh eye. By learning some simple helps and hints you can save yourself a lot of time and aggravation (you know, those days when you spend hours tossing clothing on the bed because nothing looks right?). 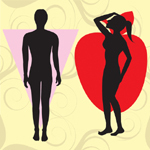 The most important body shape fashion tip to begin with is KNOW YOURSELF. What are the most positive aspects of your body? What are the least positive features? In learning what to wear for your body shape, the key is emphasizing what you like and slyly finding ways to hide what you do not. Secondarily keep your expectations reasonable. What really helps your fashion, and fashion choices, is being comfortable in your skin. Once you fall in love with your curves, then you can start figuring out how to work with them. Step three in Dressing For Your Body Shape is figuring out your generic body type. Yes, we're all unique but there are four basic body shapes into which everyone falls primarily. You have a Pear Body Shape if you have a smaller upper body with a defined waistline and more weight in your hips or thighs (triangular). You probably wear a larger clothing size on the bottom than on top. Apples are opposite of pears! You have an Apple Shape Body if your upper half is larger and you hold your weight near the waist (inverted triangle) with no defined waist. You probably wear a larger size on top than on bottom. The classic, curvy shape that's balanced above and below. Your shoulders and hips are approximately the same width with a defined waist. 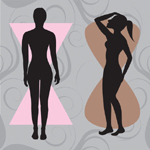 Hourglass Body Shape Fashion Tips: You have the look most women crave. Tailoring is your best friend, as are soft fabrics that dance on your curves. Do not hide those looks in loose fitting clothing! Your shoulders and hips are approximately the same width with no defined waist. Rectangle Body Shape Fashion Tips: Rectangle women need to find ways to create curves. 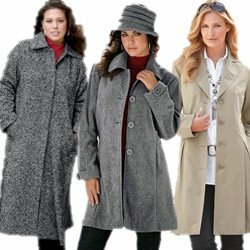 Jackets that have a bottom flair create the illusion of hips as do A-line skirts, and wearing non-vertical patterned clothing also detracts from the angular appearance. Be careful with too much tailoring!